We will be leaving the Folding top 100 in a short while. I don't see us hanging in there even if we tried, because there are some pretty serious numbers needed for that, and I think we are neither willing nor capable to do it. Would there be any interest from the rest of you to try a short burst in this project? 1) In the "glory days" of Folding, we managed about the same numbers as we are doing today, so it would be fun to see what we could do if we really put some effort into it. 2) It would keep us in the top 100 for a few more days, and we would go out in style. I would suggest about 2-4 weeks combined knightly effort, or perhaps a POTM? Location: in a rabbit hole near you!! I can barely run Folding anymore on this machine. Unfortuneately I am out since it seems they got that crazy fellow from the old Genome@Home running things now. I'd be willing to try, but I've never had a whole lot of success with the GPU version (ATI). And running the CPU version seems to go at a crawl. I might need some help setting things up if/when we decide to give it a go. Sure, there are a few nearby teams putting up only 10k-20k ppd more than us. 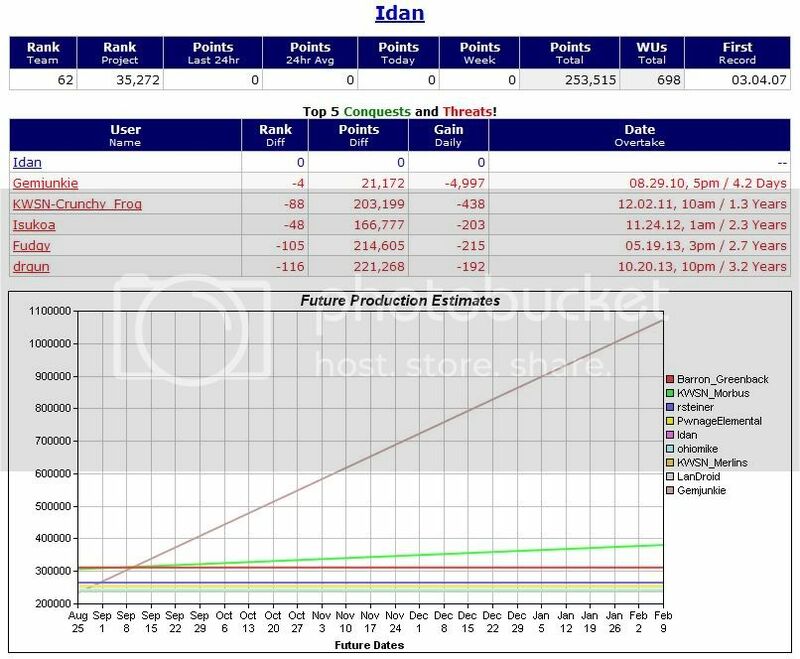 My production's dropped while doing the POTM but I'm still about to pass Sir LanDroid and even Sir Idan. Still can't get the Folding sig to work on the forum. I agree that the different clients are a bit of a mess to get into, and I've complained quite a bit about the Folding stats myself over the years. I'm not a big fan of Folding anymore, and I won't be doing it for a very long time. This would be more of a stats and test thing. I agree, even though it's just for fun, their point system is rather depressing if you don't have a supercomputer. Somebody with access to an 80-core computer at work complained about the maximum bonus for returning results quickly (100x pts.) wasn't enough, so they removed the limit. You could run a thousand regular shrubbers and get bubkis, bonus-wise. Anyway, I haven't seen any other suggestions for a Sept. POTM. I can run 2 GT240's and 10 console clients. I haven't seen how to use the HD5770 yet. My old(<4yrs!) HP pavilion is too slow to be worthwhile unless I add a graphics card, which will probably require a beefier power supply, and additional cooling, which probably means transplanting to a new case. Ugh. Any idea how many knights are potentially available? I agree, 10-20 could make things interesting. You need to post this in the BOINC part to get it included in the POTM. I thought we all agreed, rigged, never to mention that the elections are generally rigged, fair, so that we do not draw the eye of the UN. Better start soon, your lead is disappearing rapidly. I understand from this post that the contest has started Gemjunkie? Just fair warning, I've been folding since early July anyway. I hate people that run ahead then yell "Race ya!". You've got 4 days to gear up, I switched 8 cores back to Collatz for now. Say "When". You've got 4 days to gear up, I switched 8 cores back to Collatz for now. Say "When"
I wish I was in my old job surrounded by magic shrubberies that can help for the cause... alas, I have only 3 right now so it's not a fair race, but still, I'm loonie enough to race ya for the cause of folding the shrubbery genome, I just started now, the race has started! That's fair then, I'm running 1 dual-core E7400 system full time, and 2 quads, Q9400 & Q9550, 12hrs or so per day, but the Q9550 system has the HD5770 card, which the folding client won't use. Maybe it's me. I'm collecting parts for a Phenom II X6 1090T shrubber, I hope I can find enough electricity for them all. Plus the AC. I won't go without a fight! There are plenty of inactive kaniggits, so you should only go up the ranks, except when I pass you. I just had a thought, does this race have a finish line? Stop laughing. I have thoughts occasionally. How are you hanging there in our little sprint race Gemjunkie? All right the polls are open and Folding is on the ballot.